Blue Jacket, a Shawnee warrior, helped lead the Native American forces against Major General Arthur St. Clair in 1791. The clash left nearly 700 of St. Clair's people dead, compared with the approximately 40 Indians who lost their lives. The early 1790s witnessed major crises on a number of different fronts from the perspective of the federal government. It faced domestic unrest from the backcountry. On the international front there was trouble with France and England. And Native Americans in the west regrouped to pose a significant threat to U.S. plans for expansion. Frontier conditions were always sensitive and complicated cultural borderlands, but never more so than in the wake of the American Revolution. Almost all native groups had allied with the British and served as Loyalists during the war, but when British negotiators agreed upon the terms of the 1783 peace treaty, they offered no protection to their former Indian allies. Most in the new American republic saw no reason to treat Native Americans well after the war. White settlers claimed ownership of all Indian lands west of the Appalachians by right of military conquest as well as by the terms of the 1783 peace treaty. But Native Americans quite rightly rejected these claims. Indians had not suffered any permanent military defeat during the Revolution, nor did a single Native American representative attend or sign the peace treaty. 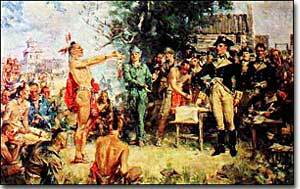 This painting shows the signing of the Treaty of Greenville in 1795, a year following the defeat of several Ohio Indian tribes at the Battle of Fallen Timbers. 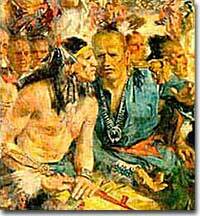 Chief Little Turtle presents a wampum belt to General Anthony Wayne. Given these fundamental differences of opinion, the Confederation government, as well as various state governments, negotiated with Indian groups to try and secure access for white settlement in the west. Numerous treaties from the mid and late 1780s created favorable terms for new settlement, but they were usually achieved through liquor, bribes, or physical threats. Although the Iroquois and Cherokee still reeled from the consequences of their strong alliance with the British in the Revolutionary War, other more westerly groups spurred a collective native opposition to the increasing threat from the American republic. For example, Chief Alexander McGillivray, a mixed blood Creek in the southeast, called for expelling all whites from tribal lands and looked to the Spanish in Florida as a powerful ally against the Americans. Native groups north of the Ohio River had an even stronger ally from British Canada. Although King George III's Proclamation of 1763 set the boundaries between the English colonies and Indian territory, the new United States looked to expand well beyond these lines. By 1790 many of these native nations formed a broad Western Confederacy to defend themselves from aggressive American settlement. Raids by Little Turtle of the Miami and Blue Jacket of the Shawnee scored major victories that included defeating U.S. military forces in 1790 and 1791. Facing a real threat from western Indians, the federal government again chose to act through martial mobilization rather than negotiation. The U.S. army in the west was dramatically expanded. General "Mad Anthony" Wayne led it to a major victory in the Battle of Fallen Timbers near present-day Toledo, Ohio, in August 1794. That battle shaped the conditions under which the Treaty of Greenville was negotiated in 1795. The Western Confederacy remained intact and the U.S. acknowledged Native American land ownership and renounced its claim to land through the right of conquest. However, the treaty also required native groups to relinquish control of large amounts of territory and bound them not to make alliances with other powers, namely the British. 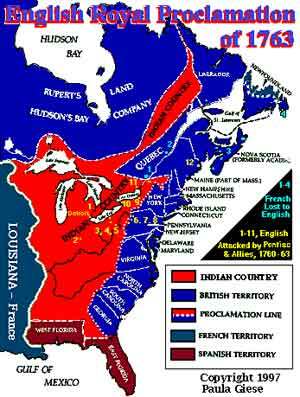 As far as western native groups were concerned, the Revolutionary War had only really come to an end with the treaty of 1795. This article, by historian Mark Hirsch, offers a look at the relationship between Thomas Jefferson and Native Americans. Jefferson viewed the natives as "merciless savages," and his belief that America would cover both Western hemisphere continents may have reflected that belief. The Avalon Project at Yale Law School is a large, searchable collection of historical documents. The top of this page has links to all of the Project's resources. Below these are links to primary documents of Native American interest, including a complete list of treaties between the United States and Native Americans. The English Proclamation of 1763 kept all land west of the Appalachian Mountains out of the hands of colonial governments, reserving it for Natives. The Proclamation also said the land was property of the English Crown.